“I wonder if he’s just trying to get out of baby duty. You sprain your elbow, it’s kind of tough to hold a baby at 2 o’clock in the morning.” –Kobe Bryant, jokingly questioning whether the timing of Tracy McGrady’s injury had anything to do with the birth of T-Mac’s third child earlier this week. Yeah, it’s easy to laugh now, isn’t it? But don’t tell me you weren’t holding your breath when T-Mac exited stage left near the end of the second half, grimacing from the pain searing through his right elbow. Sure, Rockets fans have conditioned themselves to take the McGrady grimace with a grain of salt by now. I mean, it’s not exactly the Halley’s Comet of facial expressions. Nary a week goes by that we don’t see Tracy hobbling, clutching or grabbing some painful body part. Yet this seemed different and infinitely more troubling, especially for those who remembered the shoulder snafu which befell Dwyane Wade on the Toyota Center floor back in February (though to T-Mac’s credit, at least he didn’t require a wheelchair just to make it to the dressing room). After the game, T-Mac himself admitted he had feared the worst when the injury struck. When told the ligaments were merely strained and not torn, McGrady—and Rocket nation—unleashed a tremendous sigh of relief. Rarely has a discouraging loss been served with such an inherent dose of perspective. Yes, the Rockets dropped their second game in a row, and looked bad doing it. But the damage could have been so much worse. From the sound of things, T-Mac will be back on the court in about a week, hopefully wowing us with the stellar caliber of play he displayed through the first eight games of the season. And keep your fingers crossed that the next time he breaks out his trademark grimace, it won’t be quite as heart-stopping. As for the game itself, there are a plethora of different angles worth mentioning. Among them: Houston’s disturbing difficulty with putting the ball in the net, and the crowd’s momentarily deafening “We want Steve!” chant. But for sheer shock and horror, nothing beats the officiating of Violet Palmer. Her incompetence isn’t exactly a newsflash, but it’s still stunning to witness in person. About the only positive thing I can say in her performance review is that she was consistently awful toward both teams. Is it too late to welcome Tim Donaghy back with open arms? I’m not even joking. Anyway, I’m eschewing those topics for now because—approximately one-ninth of the way into the new season—I wanted to get a non-biased, expert opinion on the Rockets’ progress from last season to today. Our guest is intimately familiar with the current state of the Houston franchise, having played a key role in the Rockets’ playoff ouster last May, in addition to competing against them twice already this season. He knows what it takes to win a ring (he’s got three), and he’s also one of the most respected players in the NBA. 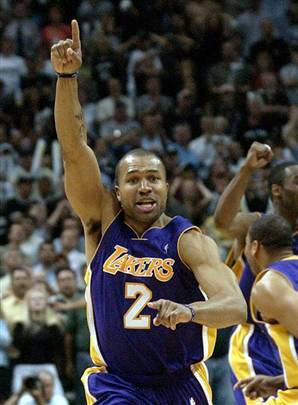 Without further adieu, here are four quick questions with Mr. .4 himself: Notorious Rocket-killer, Derek Fisher. JCF: What’s your take on the Rockets so far this year? Do you consider them on par with the likes of the Spurs and other top title contenders, or do you think they’re a notch below? DF: I think they’ve proven at the start of the season that they belong in the top tier with San Antonio and Dallas and those teams. They’ve got a really tough schedule to start the season, and even at this point they stand 6-3. That’s not bad at all. We’d love to be 6-3 two games from now. So I think they’re playing well. They’re still learning the things they want to get going under coach Adelman. I actually think they’ll get better as the season moves along and that’s a scary thought to think about. But whenever you have the type of presence inside like Yao Ming, you always have a chance to win. And you saw in that second half--even without McGrady--when you have that guy who demands the ball down low and can force teams to double-team or rotate on the weak side, leave guys open for threes, and give other guys a chance to offensive rebound, you’ve got a good chance. JCF: So you think the Rockets are actually better this season than they were last year? DF: Well, one could say that the things that they’re doing offensively around Tracy and Yao are giving them a better chance to have better balance. But it’s still going to come down to those two guys. So I don’t know if they’re necessarily better than the team they were last year. They were really good last year. They won 52 games and in the Western Conference to win 50-plus games is a great thing. So I think they’re a different team obviously with some different pieces, but being much better than they were last year is hard to say at this point. I don’t know if they necessarily need to be. I think last year we just happened to peak at the right time in that first round and finally figured out a way to win a game in this building in Game 7. JCF: Fair or not, there’s been a lot of talk about Tracy and Yao’s inability to get out of the first round. When you were playing them in the postseason last year, did you guys feel like you had a mental edge on them because that seed of doubt had to be lurking somewhere in the back of their minds? DF: I think for me at least in my experience, when you’re playing in the playoffs you don’t really have the time or the opportunity to worry about what could possibly be going on in your opponent’s mind. You’re sole focus is doing what you need to do against that team. So I don’t think at any point last year we felt like we had a mental edge. We had a lot of guys who had never even been in the first round, period. So, if anything, they had the edge in terms of at least having been in the playoffs. JCF: So you didn’t feel at all that if you could get them down to the last couple minutes, it might work to your advantage because they might start thinking about some of those demons? DF: Nah, I mean with two guys on the floor like Tracy and Yao, you don’t really want to get down to the last two minutes, because they both have the ability to either score or get to the basket and try and finish, maybe get fouled. I mean, Yao is the best big man free throw shooter in the league, so you don’t want to just depend on getting them down to the last two minutes.